Use large cupcake papers and two jumbo muffin tins to bake these cupcakes. They are glazed with either a chocolate or butter glaze and then piped with meringue buttercream. Heat oven to 350 degrees. Line 10 jumbo muffin tins with paper baking cups, and set aside. In a small saucepan, bring 1 cup water to a boil. In a bowl, combine boiling water and baking soda; set aside. In a large bowl, sift together flour, ground spices, salt, and baking powder; set aside. In an electric mixer fitted with the paddle attachment, cream the butter until light. Beat in the brown sugar until fluffy, 1 to 2 minutes. Beat in the molasses, baking-soda mixture, and flour mixture. Beat in the eggs. Fill the cupcake papers three-quarters full, making sure that the batter is divided evenly. Bake cupcakes until a toothpick inserted in the center of them comes out clean, about 30 minutes. 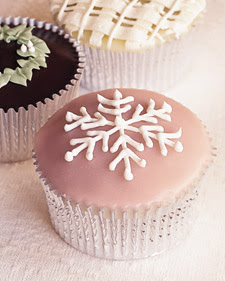 Let cupcakes cool a few minutes, then transfer to a wire rack to cool completely before decorating.